Lamesa's first inhabitants were Paleo-Indians who hunted in the area and camped along Sulfer Springs Draw about 17,000 years ago. In later times the Apaches and later Comanche's also used the draw as camp sites for their hunting activities on the plains. Sulpur Springs Draw also served as a route for later ranchers and settlers traveling to the railhead in Big Spring. Dawson County was organized in 1905 and named in honor of Nicholas Mosby Dawson 1808-1842 who fought at the Battle of San Jacinto and fell at Dawson's Massacre. The 1900 Census listed 37 persons residing in Dawson County. The City of Lamesa had its beginnings in July, 1903 when a block of 160 acres was carved out of the home section of Frank Conner’s Ranch. Earlier the town site had been part of the large Slaughter Ranch, famous for its “Lazy S” brand. 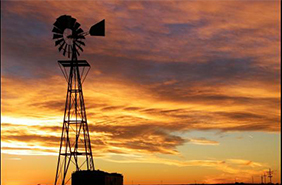 By this time ranching had been established in the area for more than 30 years. Lamesa was plotted into lots, by M.C. Lindsey, Frank Connor, J. F. Barron, and several others about two miles south of the town of Chicago, which had been established in 1893. The name Lamesa was taken from the Spanish word Mesa meaning “Tableland” because it was descriptive of the town’s location on the high plateau of the South Plains. A. L. Wasson, a member of the first town committee offered La Mesa and Lamesa as possible names. Mr. Wasson preferred the Spanish version but the committee voted in favor of Lamesa. A rivalry grew between Lamesa and Chicago and the post office was moved from Chicago to Lamesa. An election was held in 1905 to determine the new county seat of Dawson County. Lamesa won by a margin of five votes. The residents of Chicago were invited to move their town to Lamesa and the move was made in two days. Chicago passed into history and is today remembered by a historical marker on North 22nd Street. The first school was opened in Lamesa in 1902. Daily mail service was initiated in 1906 via a stage line from Big Spring. The Santa Fe Railroad operating as the Panhandle and Santa Fe Railway Company began rail service to Lamesa on Oct. 1, 1910. Lamesa received it’s first telephone service in 1905 and electric service began in 1916. During World War II Lamesa and Dawson County provided more men per capita for the armed services than did any other county in Texas. Dawson County was one of the five counties in the state to win the coveted Army Navy "E" award. Lamesa Field, an army airfield, was established in 1942 to give elementary and advanced glider training to army aviation cadets. The training field was deactivated on February 1944. The City of Lamesa was incorporated in 1917 and the first large project came in 1925 when a new city hall, water and sewer system and the brick streets around the square were built. In 1945 a home-rule charter was adopted establishing a council-manager form of government. A new City Hall, located at 310 South Main was dedicated in 1963. The Old City Hall at the corner of South First and Dallas was remodeled as the new Public Safety Building housing the Police and Fire Departments. In 1993 the City purchased the old Lamesa Federal/Bluebonnet Savings and Loan Building at 601 South First Street and converted it into a new Municipal Building housing the City Administration and Police Departments. The old city hall buildings were sold. W.C. Bishop of Chicago, Illinois, and wealthy lumberman George N. Fletcher established the Oto (later Bar To) ranch about 1887 on Fletcher's extensive landholdings in Dawson County. A post office was opened at the ranch headquarters on May 15, 1889, and named Chicago, both in honor of Bishop's home town and in humorous reference to the sparse population of the area. The postal facility served other large ranches in this vicinity, such as C. C. Slaughter's Long S. In the 1890s, Fletcher left the ranching venture, and A. F. Crowley and W. H. Godair became Bishop's partners. By that time, a village had begun to grow up around the post office. B. A. Oden served as Oto ranch foreman and Postmaster of Chicago from 1894 to 1903. When Walter Stemmons replaced him in both positions in 1904, the settlement was renamed Stemmons. The same year, a post office was established in the new town of Lamesa, two miles south of Chicago. Dawson County was organized in 1905, and both towns entered the contest for county seat. When Lamesa won, residents of Chicago quickly relocated their homes and businesses there. The school and Baptist and Methodist churches also moved to Lamesa, within days, the Community of Chicago has disappeared. For more about the history of Dawson County, please visit the Handbook of Texas Online from the Texas Historical Association.